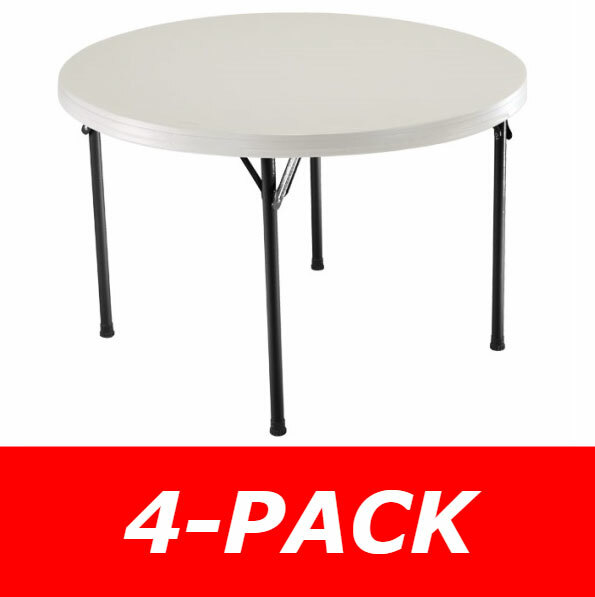 Low price guarantee on this 4 pack of Lifetime round folding tables. Call us! We are ready to help you place your order at the lowest price out there. This table comes as a 4 Pack. Comes with a 46" Round Almond Molded Top, 1.25" Round Bronze Hammer Tone Folding Frame. HDPE is well-suited for indoor and outdoor use. Does not fade, crack, or peel like traditional plastics. 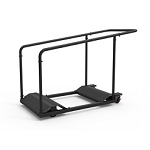 Steel folding frame is powder coated to help resist rusting. HDPE is stain resistant. Tougher stains might require a mild abrasive like Soap Scrub. Table top color: almond (Very light gray-tan color). This package comes with 4 tables. Table top dimensions: 46 inch diameter. 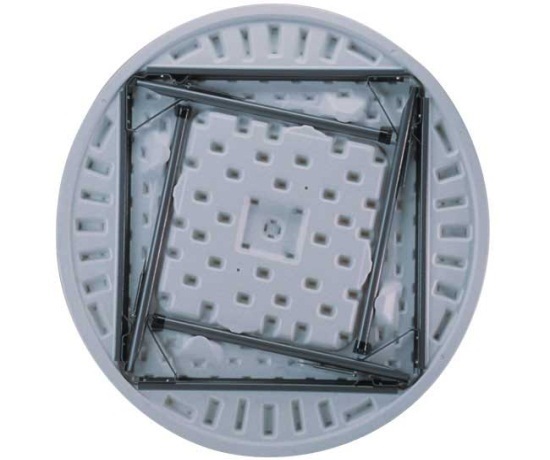 Folding frame tube dimensions: 1.25 inch diameter. Table weight: about 28 lbs. Table top weight capacity: 591 lbs. of evenly distributed weight. Shipping dimensions: 48 inches L x 48 inches W x 14.125 inches H; 169 lbs. Lifetime Tables And Chairs -Main page to help direct you to the proper category page for Lifetime Tables. 46 in. 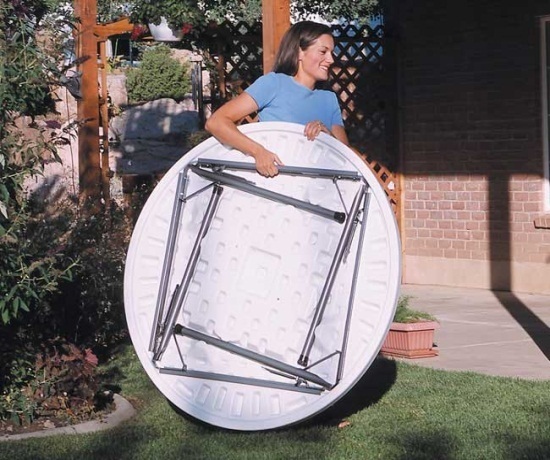 round folding table seats 6 adults comfortably. The almond color is a combination of tan and gray. 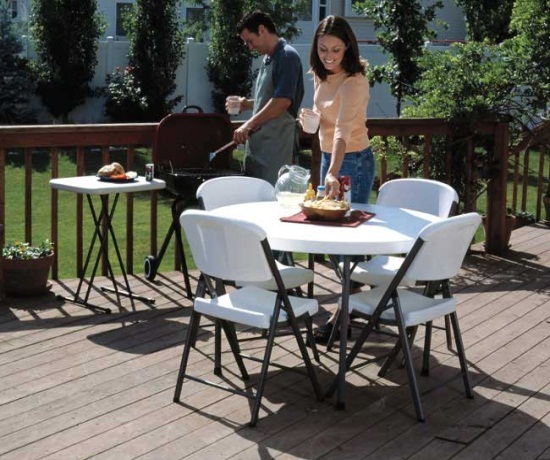 This table top matches the 2803 Lifetime folding chairs. 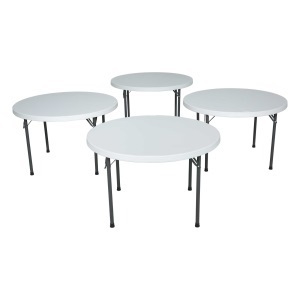 These are the perfect tables for our cafeteria -lightweight but durable. Also the delivery was sooner than expected - nice surprise! Best Folding Round Table Ever!!! Q: How many seats fit around this table, normally as well as crowded? A: Here's the thing with this table-you can fit 5 or 6 people around it, it's the legs that might give you grief. It is somewhat similar to a card table where the legs go out to the edge. So, even though you can physically see 5 or 6 people around it somebody might be straddling one of the legs. Comfortably, you can see four without any problems with the legs. Most organizations such as churches and schools purchased the 60 inch round table to avoid this problem. The 60 inch round table has legs that are recessed so that you can see all the way around. Those seat 8 people comfortably. That would be model number 880301 for the white color. Dimensions: 48" x 48" x 11"